Tuesday Remix – This is a popular post from last year, updated and rerun for your consideration. Last year’s big vote on Proposition 8 in California raised the question (yet again) as to what, exactly, the church’s role is in the social fray surrounding the issue of alternative lifestyles and gay marriages. There seem to be several “sides” formed within the church to answer that question. One side says our role is to police the behavior (the morals, if you will) of the community we serve. Mind you, that is more than just having an opinion about what is right and what is wrong. It is actually taking action designed to change people’s behavior. And toward that end, we have some pretty ugly protests (see photo inset for example of what I mean by “ugly”) by “Christians” of the whole gay marriage thing. As a mediator, it is my habit to address one side of the conflict at a time. I’m going to pick on that side today. 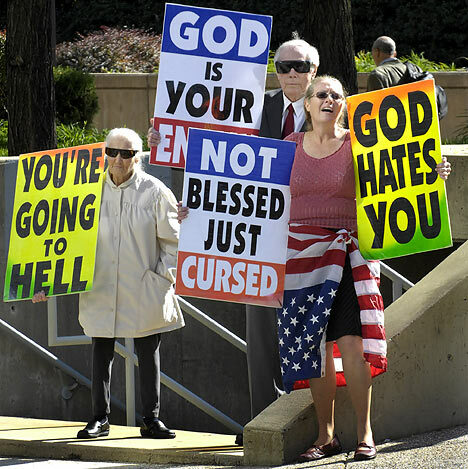 How afraid, how utterly gripped with fear, must a Christian become in order to lash out with this kind of venom? I do understand a Godly concern that the moral fiber of our country is getting pretty threadbare. Moreover, I too am bothered sometimes by the political agendas of people who have a very different worldview than I have. But that is what happens in democracies. And I have no real problem with Christians taking an active role in political issues; “whatever your hand finds to do, do it with all your might.” Believe me, I “get” that concept (I am a lawyer after all). But what does not compute for me is the hateful, vitreous, and even vulgar language coming out of the mouths of professing followers of Jesus, the man who looked out over a city and wept, but who did not then take up a protest sign and yell obscenities at the wrong-doers. If the objective behind these “protests” is to change the behavior of our community and to help save lost people, then I have one question (stolen shamelessly from Dr. Phil): “How’s THAT working for you?” I mean, seriously, these “protests” have been going on for centuries–and here in our country, they have been on the front pages of our newspapers for several decades now. So, we should now have enough empirical data to look at and measure the effectiveness of this tactic against the purpose its supporters espouse. So, all together now, does everyone think we have become a MORE moral society as a result of these efforts? When Paul wrote his first letter to his “problem child” church (the one in Corinth), here is what he said about sexual sin: “What business is it of mine to judge those outside the church? Are you not to judge those inside? God will judge those outside.” I Corinthians 5:12-13. There is an important Spiritual truth here: it is not the role of the church to try and make lost people act like saved people (note: not everyone who lives in an alternative lifestyle is a non-believer–this post only deals with how we as a church relate to those outside the church…stay tuned in future posts for my thoughts on how best to relate to those inside the church). Have we not yet learned, after centuries of trying, that this is a futile effort? Our world is not getting MORE moral, it’s getting LESS moral, just like God’s Word tells us it will as we move through time. And it is not the job of the church to hold those outside the church accountable for their moral decisions. Our only job in relation to those outside the church, it seems to me, is to show them Jesus. And for those who think the signs in the picture above (and any related or similar activity) are showing people Jesus, well…I don’t know what to tell you. They are not. Think about the energy and resources those inside the church have wasted on trying to control the behavior of those outside the church. Toward what great uses might those resources and energy be re-directed? But what about those inside the church? What responsibility do we have to one another when it comes to sin in our lives? Ah, now we have stumbled upon a very different question. One which we can talk about in another post. This entry was posted in Christian Accountability, missional, The Church's Influence and tagged Christianity, church, gay marriage, protests on February 3, 2009 by Blake Coffee. I agree that protests like the one shown is the wrong approach. I am a part of a post abortion group called Silent No More Awareness, our goal is to help women and men who have had an abortion or have suffered because of someone elses abortion. We speak in churches, ones that will let us, we go to planned parenthood clinics to pray, do some sidewalk counseling, hold signs and hand out pamphlets. We are in no way confrontational or do we have hateful signs. Our signs read: I Regret My Abortion or Lost Fatherhood and Women Need Love Not Abortion. We don’t call people names. I was involved in a rally this past week outside of a hotel where planned parenthood was holding their annual luncheon. We held our signs, prayed and shared our testimony. We are just a presence to let people know that abortion not only kills a child it hurts others as well. Many women and men have been helped because of this presence, especially at the abortion facilities. These people will come up to one of us to talk rather than any of the others that are confrontational. We make a very conscious effort to not judge anyone. What I am saying is that, yes some protesters are wrong in their approach but we can’t sit in our pews and do nothing but pray and hope things get better. I for one will not. I know that I will not change the world but if I can save one life then it was worth every minute. I know that the Lord called me and equips me daily to do this task so I will until He says stop. That photo looks like — who is it, Phelps? No, no one thinks this shows Jesus. But Dr. Martin Luther King and William Wilberforce come to mind– motivated by God’s word, peaceful, respectful, and ultimately effecting betterment of society. Especially in response to governmental or societal wrongs, people who are called “for such a time as this” may be anwering a God-call. Jesus’s last command to his followers was to make disciples. It was not a command to use the civil law to shut down a business or to picket an objectionable activity or event. There was plenty of immorality in Roman society, yet there is no record of Jesus, Paul, Peter, et al ever going downtown to picket. The fact is, sinners will act like sinners. If the saints use civil law to make sinners merely act like saints, then the sinners will be confused about what makes them acceptable to Christ–since they now ‘satisfy’ Christ’s vocal ambassadors who forced a behavior change on them–and the sinners may never get saved! Social reform is not the cause for which Christ lived and died. He lived to establish sincere relationships and died to demonstrate ultimate love and grace that draws people to himself when he (not civil law) is lifted up. When anyone calling themselves ‘Christian’ resorts to civil law and protests to reform social behavior (even if it is admittedly sinful), then they have abandoned the power of the Gospel and made a poor substitute for the Great Commission. Jesus’ own disciples misunderstood the nature and manner of hsi methods and the kind of kingdom he came tro establish. That error persists. The remedy? Establish meaningful relationships with sinners, win their hearts to Jesus, and the social behavior will change, no thanks to the civil laws.